The scan doesn't do this postcard justice. The background fabric is a rich chestnut with a lovely sheen. The right hand leaf has been made by sewing two layers of green taffeta together, turning right side out and then top-stitching. 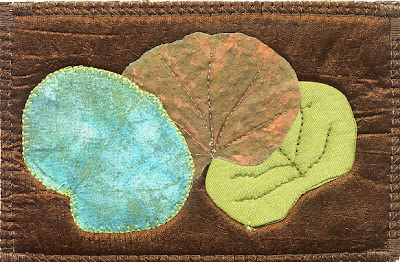 The centre leaf is a digital image printed onto fabric, and the third is made by using the original leaf to stamp in gold onto a turquoise batik. The whole is the work of Lourdes on ArtWeMail. 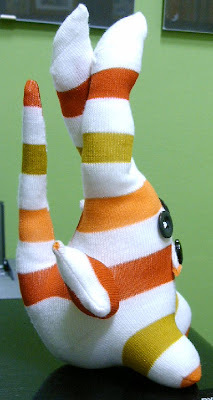 I have had fun making another Sock Monster. He is called Nastertius. He is a little too cute to be a real Monster, so I have it in mind to make another one of the same outline, but to have it the other way up with the eyes on the ends of what are now the legs, and the tail becoming an extension of the head! Sitrus, my "first born", went down well at the Craft Exhibition on Sunday, and I have been commissioned to make two more for the grandsons of a friend. One has asked for blue stripes and the other for green, but if I can't find any green striped socks, he will settle for blue, but he does want a green tongue! 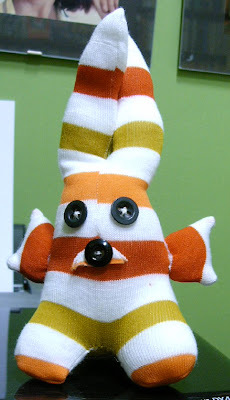 Loving the latest sock monster! But you're right, he is way too cute for a monster moniker! Nice leaves - I was in the other group for that swap, which is a shame, I would have liked those!